Fires, flood, storm and smoke damage – it happens. If your favorite photos are scanned and backed up properly, they will be protected from these disasters. Who remembers all the photos that were blown miles away during the tornadoes a few years ago. Save improperly stored photos before it is too late- The process of looking for photos to scan will uncover potential storage issues that may be harming photos. This will be a good opportunity to remove those pictures from sticky/magnetic albums or other problem storage issues. Photos do deteriorate – especially if in poor storage conditions. Take a look at color pictures from the 60s and 70s. Often they are faded and Yellowed. 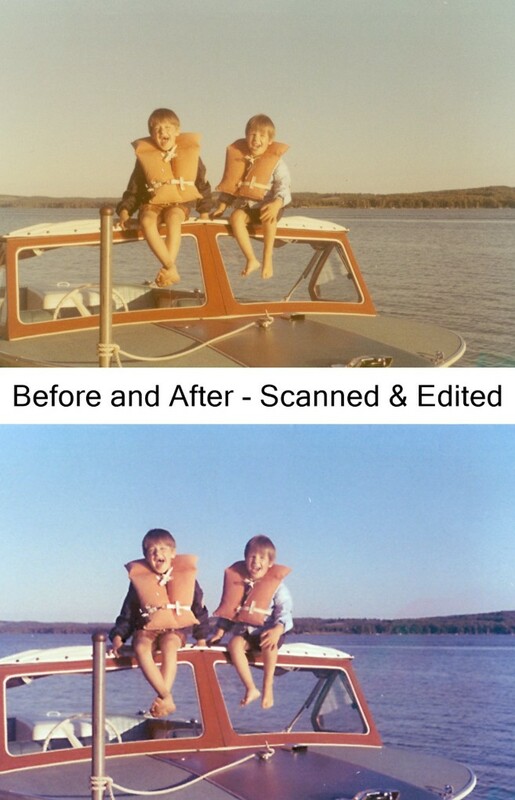 When photos are scanned the digital image can be easily color corrected! Sharing – now that an image is scanned you can share with uncle Bob or your sister Sue or you can post to social media. Listen or share stories before it is too late – as we treasure hunt through our photos, and photos of family members, it is a perfect opportunity to find the story behind the photo. The earlier you start the process, the more likely the person will still be around to tell that great story and you can capture it in the metadata of the photo. Scanning photos now will be readily available when celebrating a special event like a birthday, graduation, anniversary. This is also especially helpful when creating a photo memorial for a funeral. Digital photos can be easier to find – if you add file information to your digital files you can search in Windows or Finder for your photos. Have you been to Disney several times? Search on Disney and all your photos will be listed. In a divorce, both parties can have a copy of all the photos. Create a shared extended family photo collection – often over time, different family members have different photos of different events. Families can collaborate and share their favorite family photos with others. Make photo books and all sorts of photo gifts with your new found photos.